Some houses hit the market in already-beautiful condition. Still, there’s always room for improvement. Ned Ormsby of Lithic Construction gave us his expert opinion on how to take a lovely Belmont house to the next level. 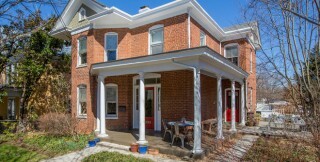 This is a solid brick house built in 1920 in a great location in Belmont. The rooms have the generous proportions common to Belmont, perfect for entertaining and gracious living. However, as is common with houses of this era, there is only one full bath on the second floor and a half bath on the first floor. This is fine if you don’t mind sharing. But the large 10?x10? closet off the master bedroom could, with a little work, be transformed into a nice master bath by adding a sink, toilet, and small shower with a glass surround, while still leaving room for a small closet. In order to install the new master bath, a plumber would need to run new supply and waste lines to the area. These lines would have to be boxed in on the first floor foyer, but wrapping the pipes into a new front hall closet would get the job done without detracting from the flow and aesthetic of the home. The cost of adding a shower, sink, toilet, and associated plumbing and finishes would be in the ballpark of $15,000-$18,000 depending on the level of finish. The other project we would recommend for the house would be to upgrade the shed in the backyard. This space could be utilized to accommodate whatever your needs may be. The 14?x24? shed is well built and the exterior is very well constructed. By adding insulation, drywall, a mini-split HVAC unit, and a small bathroom if desired, the shed could make a comfortable extra bedroom for a teenager, a place the in-laws can stay for an extended visit, home office, exercise room or a shop you could work in year round. You’d spend about $21,000-$24,000 to finish off the shed and gain more conditioned living space and comfort in this home.